Add admin settings for picking between disabled, paired, and native theme support. See #1196. Prevent making AMP Gutenberg blocks available when AMP is not native. Prevent serving dirty AMP by forcibly sanitizing all validation errors when amp_is_canonical(). See #1192. Add checkbox for automatically allowing tree shaking. This is not shown when native/canonical because dirty AMP is not allowed. Add checkbox for automatically sanitizing all validation errors (including tree shaking). When validation errors are automatically sanitized, ensure the terms' term_group is updated when re-checking. Update AMP_Options_Manager::get_options() and to return default values. Prevent showing amphtml link in paired mode when it is known that the URL has blocking validation errors. Add link to General settings admin screen in plugin links. Improve UI for distinguishing between validation errors which are rejected but which are also forced to be sanitized (such as in native AMP mode). These are shown as flagged. Fix: Remove menu-toggle in Twenty Fifteen if there is nothing to open. Add an AMP status item to the admin bar to give easy access to the Invalid URL post for any given URL, with an indicator for whether AMP is available, or else to initiate a validation check if no such post exists. 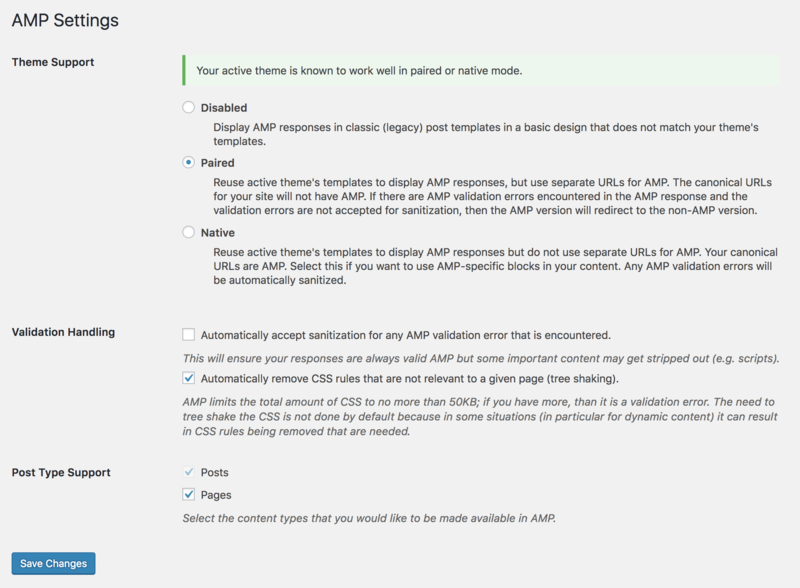 * Add admin settings for picking between disabled, paired, and native theme support. See #1196. * Add checkbox for automatically allowing tree shaking. * Add checkbox for automatically sanitizing all validation errors (including tree shaking). 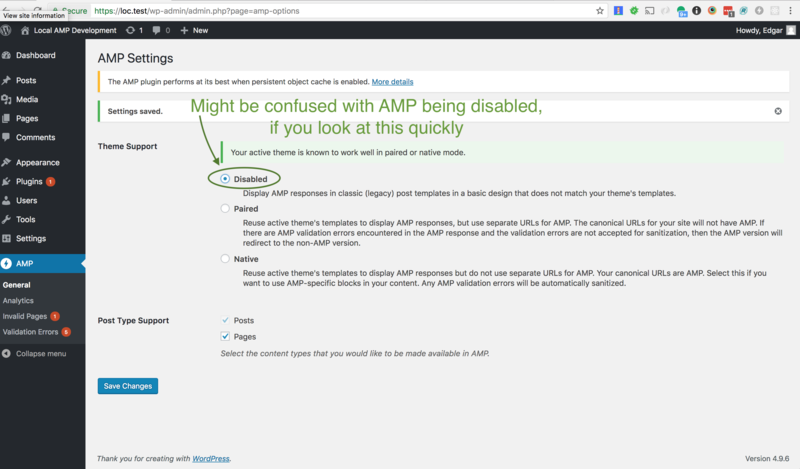 * Prevent serving dirty AMP by forcibly sanitizing all validation errors when amp_is_canonical(). See #1192. * When validation errors are automatically sanitized, ensure the terms' term_group is updated when re-checking. * Update AMP_Options_Manager::get_options() and to return default values. This looks really good, especially the new 'AMP Settings' page. There are a few small points, but no blocker. It's nice how this can force theme support. Good description of legacy templating. Maybe "Disabled" could be "Classic Templates (Disabled)." That's a great point. Agreed. And “Paired” doesn't really make sense to users at first look either, nor does “Native”. I don't feel great about these these latter two. Renamed Disabled to Classic in 5bae33e. Needs more iteration. Maybe “Template Mode” would be better since it's clearly related to AMP already. Do you think the methods tally_content_requiring_amp_scripts() and print_dirty_amp_scripts() could be removed, given that they're not used anymore? Maybe the comment below could link to them. These changes are of paramount importance for success on the adoption of the plugin. Great work. 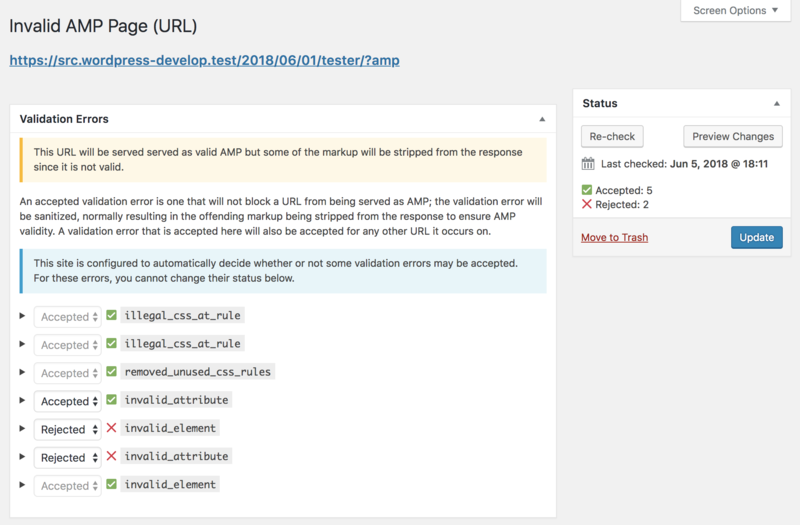 BTW, the PR regarding URL handling (#1203) is a dependency for the PR regarding the new validation error screen because it ensures that the amp_invalid_url post for a given URL will always be stored with the canonical URL which will then allow for us to reliably add an “AMP Status” item to the admin bar. 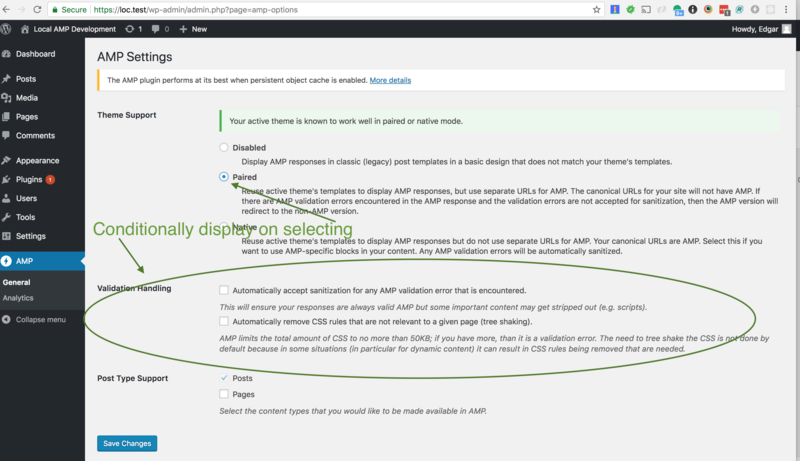 This is important because if there are unaccepted validation errors on a paired URL then they will get redirected to the non-AMP version and this admin bar item can indicate why. Likewise, we need to omit the amphtml link from the canonical page if there are unaccepted validation errors on the page. 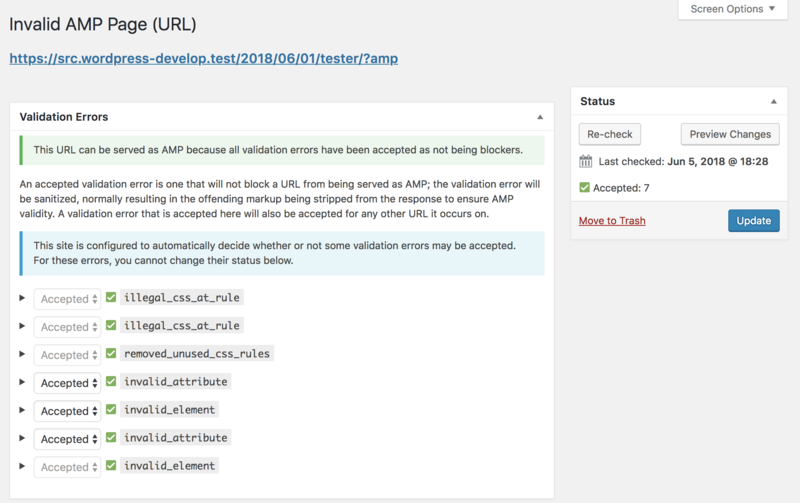 * Indicate the count of validation errors that are blocking AMP from being available. * Allow passing URL string in addition to amp_invalid_url post to AMP_Invalid_URL_Post_Type::get_invalid_url_validation_errors(). 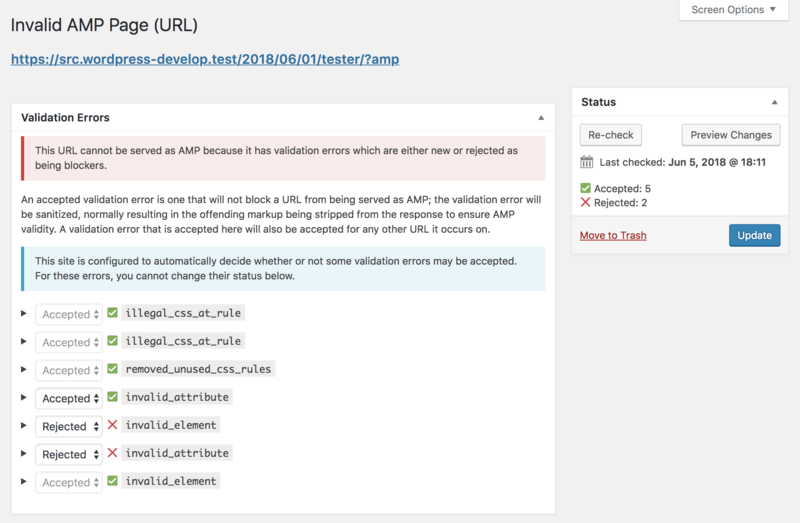 * Remove automatically setting amp_validation_error term_group based on forced status. * Let preview URL include development=1 flag. This is great stuff, @westonruter! 🎂 🎉 I really like the thought you've put into this. * Allow tree shaking setting to be shown when in native mode. * Show notice when selecting native mode that sanitization is required. * Hide the preview button from the amp_invalid_url post if sanitization is required. Discontinue automatically-deleting an amp_invalid_url post when all errors are resolved. At some point, it'd be appropriate to test this. But as work on the Template Modes is ongoing, I'd propose that we don't need to test this now. But if you have other ideas, feel free to move this back to "Ready For QA."